Council District 12 has one of the highest rates of volunteerism anywhere in the City. From folks who engage in street clean-ups, to organizations that tell the history of our region, our communities are dedicated to giving back and lifting each other up. The Devonshire Division of LAPD is one of the major beneficiaries of this spirit of volunteerism. Hundreds of individuals devote themselves to improving public safety in our neighborhoods in many different ways. 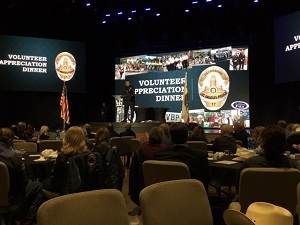 In order to show our appreciation, Devonshire Division hosts a thank you dinner for volunteers while honoring those who have gone above and beyond in serving our communities. Many thanks to the honorees for their outstanding service and to all volunteers who help protect and serve our communities.